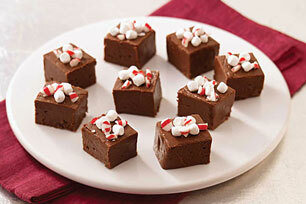 Topped with marshmallow bits and crushed peppermint candies, this dreamy, creamy fudge has a distinctly festive flair. Line 9-inch square pan with foil, with ends of foil extending over sides. Bring sugar, butter and evaporated milk to full rolling boil in 3-L saucepan on medium heat, stirring constantly. Cook 4 min. or until mixture registers 234°F on candy thermometer, stirring constantly. Remove from heat. Add chocolate and marshmallow creme; stir until melted. Add vanilla; mix well. Pour into prepared pan; spread to cover bottom of pan. Cool 5 min. Sprinkle with marshmallows and candies; gently press into fudge with back of spoon. Cool completely. Use foil handles to lift fudge from pan before cutting into squares. To prepare the fudge in the microwave, place butter in 4-L microwaveable bowl. Microwave on HIGH 1 min. or until melted. Add sugar and milk; mix well. Microwave 5 min. or until mixture begins to boil, stirring after 3 min. Stir well, scraping down side of bowl. Microwave 5-1/2 min., stirring after 3 min. Let stand 2 min. Add chocolate and marshmallow creme; continue as directed. It takes about 20 peppermint candies to make the 1/2 cup crushed candies needed to prepare this recipe. Place desired number of candies in resealable plastic bag. Close bag and crush candies with a rolling pin, mallet or hammer. Or, process in a food processor using pulsing action.